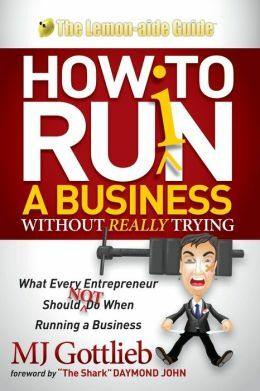 the book: How to Ruin a Business Without Really Trying: What Every Entrepreneur Should Not Do When Running a Business – a sometimes hilarious, sometimes hard-hitting book of lessons for entrepreneurs. It’s actually three books in one: The first section, entitled “My Most Famous Screw-Ups” conveys 39 general rules for starting and running a business; the second part gives advice specific to making deals and includes profiles of different kinds of investors as well as a “Play by Play” of doing a deal; the book wraps with a final section of how-to’s. Dot Every I, Cross Every T, Leave No Stone Unturned, Believe Wholeheartedly in Murphy and Go Over Your Checklist Thrice…and Don’t Trust a Soul — Several of the principles MJ lays out deal with the need to pay attention to details, prepare for the unexpected, and do due diligence. Never Go On a Suicide Mission is a recurring theme. MJ advises, “Always remember to build your own insurance policy in your business.” In some cases this means diversifying your customer base, sometimes it involves having back-up plans in case promised money doesn’t come through. the brand story: The book’s overarching narrative is the story of MJ’s personal journey through two major failures. The first stemmed from the BNW brand of apparel that began one evening when MJ and his partner Gary walked into a club giving away t-shirts for MJ’s band and ended the night with several thousand dollars in case in their hands from having sold all of the t-shirts out of their trunk. Within a few short years, they built a pretty sizable business. But it ended just as quickly when the factory that made their product went out of business and they had no back-up plan. A few years later MJ and Gary got a second chance and started a second company, Entrig. But once again their overnight success turned into a big flameout because MJ trusted the wrong person to run their production. He wrote this book to help others do just that. the bottom line: I have been recommending this book to all the young entrepreneurs I know. They don’t know what they don’t know about the day-to-day of running a business and it will be a valuable guide.